As I explained in my previous email, the position is very complicated, and far from being resolved mathematically, we are still in the middle game and there are plenty of variations that can be played by both sides depending on the style of each of the players. a) 23. Nxf8 Bxf2+ 24.Kh1 Rxf8 25. Rf1 (if 25 Bxa5 Bxg3 and black are already better) a4 and Black has two pawns for exchange and an unclear game. b) 23. 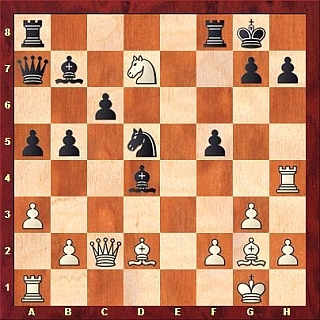 Bc3 Bxc3 24.Nxf8 Rxf8 25.bxc3 Qc5 and black have one pawn for the exchance and atack over weakness of the white queenside pawns. Mit 25...a4 26.Lc3 erreicht Weiß nun entscheidenden Vorteil 26...Sxc3 ( auch 26...Lxg3 27.hxg3 Lc8 (27...Sxc3 28.Txf5 Td8 (28...Txf5 29.Dxf5 ist bereits verloren ) 29.bxc3 mit großen Vorteil) 28.Lxd5+ cxd5 29.Ld4 Dd7 30.Tc1 mit Gewinn für Weiß) 27.bxc3 Lxg3 ist noch das Beste (27...Lb6 28.Txf5 c5 29.Da2+ c4 30.Txc4!! Lxg2+ 31.Kxg2 bxc4 32.Dxc4+ Df7 33.Txf7 Txf7 34.Dc8+ Tf8 35.De6+und die Partie ist entschieden) 28.hxg3 Lc8 29.Lxc6 Dc5 30.Da2+ Kh8 31.Dd5 und der Turm mehr garantiert den Gewinn - zum Beispiel 31...Dxa3 32.De5 Tf6 33.Lxb5 Df8 34.Txa4.